Mandy Gull is a member of the Cree First Nation of Waswanipi and is the second woman to be elected Deputy Grand Chief of the Cree Nation. First elected to public office in 2014, she served as Deputy Chief of her home community, the Cree First Nation of Waswanipi. She held the Finance, Administration, Housing and Mining negotiation portfolios. She held a seat on the Executive Committee and led files that included mandates in the implementation of financial management and strategic planning for the community. As negotiator holding the mining portfolio, she was heavily involved in ensuring a strong relationship with, and understanding of, the mining industry and the companies operating in the Cree territory. Taking on a mandate to develop the economic role of mining for the benefit of her community, she was key in engaging partnerships and developing Waswanipi as a key player in the mining industry. Her successes included the creation of successful community-owned joint ventures in Camp and Janitorial services, Drilling and Exploration, and a construction company. She was instrumental in establishing Waswanipi as a key player within its traditional territory, and ensuring that mining exploration would be carried out so as to be aligned with community concerns and environmental protection. Mandy has also represented the community in its efforts to protect the last intact forest in the Cree territory. This included developing partnerships with various non-governmental organizations and presenting the community’s positions at various venues that showcased the importance of protected areas for the Cree community. She had the unique opportunity to present the community’s position at the Sustainable Fashion summit in New York City and also at the Skoll Foundation at Oxford University in England. She has also served as a representative of her community on the Cree Nation Government’s Council. Mandy successfully pursued an educational path that included Bachelor of Arts degrees in Political Sciences and another in Public Affairs and Policy Study from Concordia’s School of Community and Public Affairs. 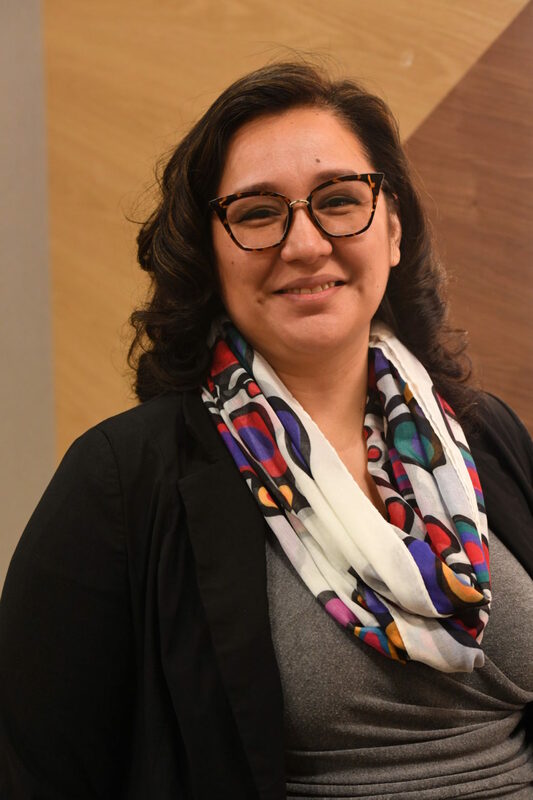 She has over 12 years of experience in administration and management working for various Cree entities and organizations at both the local and regional level. She also ventured out as an entrepreneur and for a number of years operated the first female Cree-owned management consulting firm–Kapatakun Consulting—which provided support and services to clients throughout Eeyou Istchee. Mandy has always been an active community member. From an early age, she has taken on responsibilities on numerous boards and councils, such as Vice-President of her Student Council, President of the Cree School Board’s Montreal Student Association, Board member of Awash Daycare, Waswanipi local President of the Cree Women of Eeyou Istchee Association, and Board member and Corporate Secretary of Mishtuk Corporation. As Deputy Grand Chief and Vice-Chairperson she is pleased to the serve Eeyou Istchee in mandates that include Chairmanship of the Eeyou Land Use Planning Commission, Justice Committee Member, and leading the Cree-Quebec Table on Environment and Protected Areas. She is also a member of the Cree Nation Government Executive Committee, Board member of the Eeyou Istchee James Bay Regional Government, and Honorary Member of the Cree Women of Eeyou Istchee Association.